Having a presence on the Web on a wide scale is great, but what’s even better is having a strong presence in your local market. Though local search engine optimization (SEO) is sometimes tricky to navigate, there are some steps you can take to enhance your company’s presence on the Web. One of the easiest ways to amp up your local SEO efforts is to place your business on local listings like Google and YP. Don’t minimize the usefulness of listing your business on social media sites like Facebook. Make sure you use phone numbers and addresses consistent with the area you are targeting. If you find that your business is already listed, claim your listing to ensure accuracy of the business information. Make sure you’re listed in the correct categories and place relevant keywords in your business description. However, avoid spammy keywords and keyword stuffing, as this could have a negative effect on your efforts. Additionally, make sure you’re listed with the local chamber of commerce. Creating professional relationships with local news stations, publications, and bloggers can create opportunities for link building. If your business hosts a local event, get the media to cover that event. Once a news post or article is written (or if there is coverage at your event), post the link to that coverage on your social media pages or within your website. Content will always be king when it comes to any sort of optimization strategy. 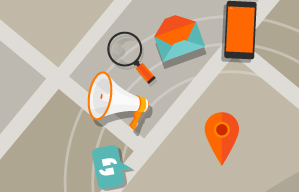 When it comes to local strategy, content should play a vital role in your efforts. Blogging is the easiest way to create fresh content for your website. Create regular blog posts tailored to the market you are targeting. Encouraging your customers to review your products and services on your business listings and social media pages can also assist your local SEO efforts. Spammy keywords: Make sure, when adding localized content to business listings and social media pages, that the locally optimized keywords aren’t added excessively. Read your content aloud before publishing it. If it sounds sales-y or redundant, you need to edit your content. Too little content: Customers are looking for you for a reason. If they land on your listing or on your website and cannot find what they are looking for due to little relevant information on the page, they will not return. Duplicate pages: Make sure you’ve checked for your business before creating a page. Duplicate pages dilute your digital authority and could impact you negatively in the long run.